2018 was kind of an odd year around here. I’d hoped to have the blog more populated than it currently is, but life happens. That said, happy new year! It’s 2019 now, and we’re finishing out our winter break (It’s futile to attempt to homeschool while my 20-year-old is home visiting from college. It’s just too much excitement for my kindergartener and preschooler.) That said, I think they are as ready as I am to get back into our routine. We have some new activities for the new year – Girl Scouts, basketball, hip hop dancing, and even Little Miss Ladybug will be taking a tot dance class. I’m really looking forward to all the fun opportunities this year. We managed to catch Paw Patrol Live over this past weekend, and the kids got a big kick out of it. I was impressed with it, I’d never seen a kids show live before, and was quite taken with the detail on the props and storyline. What are your goals for 2019? For me, I want to make sure I’m adding in fun science and art projects. I’ll need to put them on the calendar to make sure that they get done. It’s not that I don’t enjoy doing them – I really do, and the kids love them. It’s just that when things get busy, those are often the first things that get set aside in the name of “saving time” and I’m tired of doing that. I also have a personal goal of reading at least 12 books this year. I’m going to be started with Margaret Atwood’s A Handmaid’s Tale. I know, I know, I’m a little late to the game, but I binge-watched the show on Hulu while I was sick (I really don’t suggest doing that unless you’re a glutton for punishment), and now I feel the need to read the book. I also want to make better use of our local secular homeschooling group and try to make meetings at least once a month. It can be hard when running a business from home and with no car, but I think it’s necessary to make a stronger effort. What are your 2019 goals? Feel free to share them in the comments! Posted on January 7, 2019 by Ronda Bowen	• This entry was posted in Homeschooling Life. Bookmark the permalink. You’re so right about the difficulty of homeschooling while college students are home ALL day! 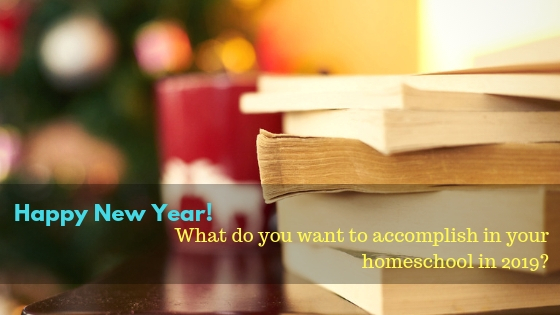 My 2019 goals include homeschool consistency (made a January checklist for each student – going great!) and working on my blog (procrastinating on this by checking out other blogs!). That’s great! YES! Homeschool consistency is great – especially having a checklist. Hahah Thank you for stopping by my blog while you were procrastinating! I hope you’ll stop by again!